Riding a two wheeler and documenting it has changed over the last seventy years. 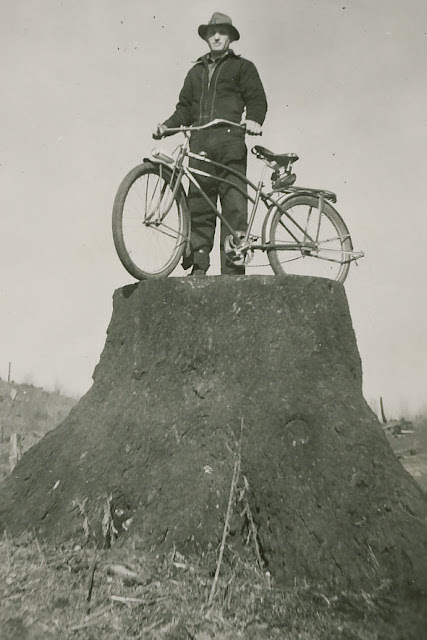 My Dad is pictured below with his bike on a stump that he created while logging and clearing land to farm in Glenbush Saskatchewan. I wonder what he would think of kids riding bikes at three years old. I remember learning to ride a two wheeler. It was a big lug of a thing. I don't have any pictures or video's to document my achievement so you'll just have to take my word for it. Lil' farm hands Daddy was documented riding his two wheeler with training wheels (that is apparently how it was done back then) before going to school. 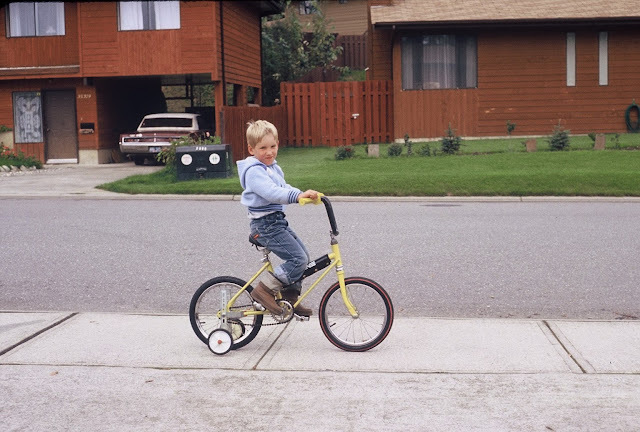 .and I can vouch for him that those training wheels were gone soon after this picture was taken. I thought again as I worked on this post how much blogging means to the person blogging. I smile as I look back at old photos. I smile as I watch the little clip. I watched it over and over again on my iPhone before deciding to post it to my blog. The little "hare" flying on his bike. . .catching up to the little "tortoise" (KM)who took herself a head start. ..and then she continues on in joy. . passing him and declaring it all to be fun. It is these moments that make life enjoyable. . .little bits of memories and little bits of what is happening today. . .all of it documented for days down the road. ..when my blogging will someday stop. ..but the memories will go on. The memories are precious and so much fun to document. He is a fearless rider. Fun times! That is a really cool picture of your father! And, that is an amazing clip of Lil Farmhand! At his age, that skill is rare!!! Pictures and words...bikes then and now...memories preserved for the future. Amazing what Lil Farmahnd has all achieved in a few short years! That was so sweet! Who doesn't remember her/his first solo ride on two wheels? Way over here, I'm running after a little fellow on a scooter - a great keep-fit plan for Nana! I love the photo of your Dad...that looks like the kind of bike that everyone is driving today again..."The Cruiser" Sort of looks like mine. Your Lil' Farmhand is doing very well on his bike...three?! Wow! And I loved seeing his little sis racing down the sidewalk along with him. So cute! She's going to be needing her own bike soon. That was fun! I love the picture of your dad. I loved this post! Generations of memories --- the cycle of life. Thanks for sharing your memories.